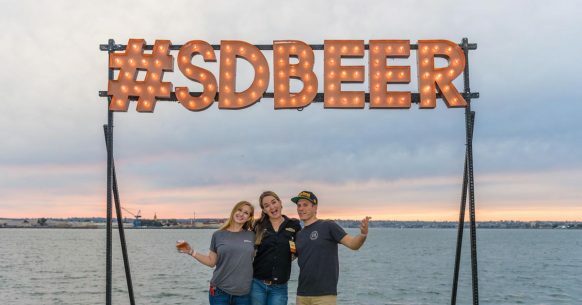 This year, America’s Finest City celebrates its 10th-annual San Diego Beer Week (SDBW), honoring its vibrant indie brewing community, presented by the San Diego Brewers Guild and Lyft. From November 2-11, fans will enjoy more than 500 beer-centric events throughout the county, showing off the best of San Diego’s indie brewers. Whether you’re a craft beer aficionado or new to the scene, this week provides the chance to try all San Diego independent brewers have to offer. The festivities begin with a Countywide Virtual Toast on Friday, November 2 at 7:30 PM PST. To join in the toast, fans can share photos or videos to social media using #SDBEER and #SDBW. Find a multitude of special events at participating breweries, tasting rooms, bars and restaurants at sdbeer.com/events. Guild Fest, the official kick-off party to SDBW on November 3, is completely revamped, starting with a brand-new location in Downtown San Diego at Embarcadero South. The day will be filled with unlimited beer samples from more than 60 independent breweries and food will be available to purchase from local craft beer-friendly restaurants. Fans may also choose to celebrate with a VIP harbor cruise around San Diego Bay before the main event. Small food bites and specialty beers will be served aboard, including the 2018 Capital of Craft IPA. To celebrate San Diego’s craft beer community, members of the San Diego Brewers Guild collaborated to create Capital of Craft IPA, a West Coast-style IPA with citrus and tropical fruit qualities and a crisp hop finish. Fans can enjoy this beer starting November 2., and it will be on tap throughout San Diego County for a limited time. For more information about SDBW, visit sdbeer.com/sdbw. Download the SD Beer App on your iPhone or Android to find events, interactive maps, brewery profile listings and more at sdbeer.com/app. This entry was posted in San Diego Events and tagged brewers guild, county, culinary by Guest Blogger. Bookmark the permalink.